Thomas Ustick Walter of Philadelphia, Pennsylvania was an American architect, the dean of American architecture between the 1820 death of Benjamin Latrobe and the emergence of H.H. Richardson in the 1870s. He was the fourth Architect of the Capitol, responsible for adding the north (Senate) and south (House) wings and the central dome that brought the U.S. Capitol building to essentially its modern appearance. Walter was one of the founders and second president of the American Institute of Architects. Walter's first major commission was Moyamensing Prison, the Philadelphia County Prison,designed as a humane model in its time. He first came to national recognition for his Greek Revival design of Girard College for Orphans (1833-48) in Philadelphia, among the last and grandest expressions of the Greek Revival movement. Walter was also the architect of mansions, banks, churches, the hotel at Brandywine Springs, and courthouses, including his design and construction in 1846 of the Chester County Courthouse in West Chester, Pennsylvania, implementing the Greek Revival style. It has also been suggested that Walter designed the Second Empire styled Quarters B and Quarters D at Admiral's Row. Among the notable residences designed by Walter were his own home, located at High and Morton Streets in Germantown, Philadelphia, Pennsylvania, the Nicholas Biddle estate Andalusia (estate), Inglewood Cottage, and St. George's Hall, residence of Matthew Newkirk, president of the Philadelphia, Wilmington & Baltimore Railroad. Walter also designed the Garrett-Dunn House in Mt. Airy, Philadelphia, Pennsylvania, which was destroyed by fire after being struck by lightning on August 2, 2009. By far the most famous construction of Walter's is the dome of the US Capitol. By 1850 the rapid expansion of the United States had caused a space shortage in the Capitol. Walter was selected to design extensions for the Capitol. His plan more than doubled the size of the existing building and added the familiar cast-iron dome. There were at least six draftsmen in Walter's office, headed by Walter's chief assistant, August Schoenborn, a German immigrant who had learned his profession from the ground up. It appears that he was responsible for some of the fundamental ideas in the Capitol structure. These included the curved arch ribs and an ingenious arrangement used to cantilever the base of the columns. This made it appear that the diameter of the base exceeded the actual diameter of the foundation, thereby enlarging the proportions of the total structure. Construction on the wings began in 1851 and proceeded rapidly; the House of Representatives met in its new quarters in December 1857 and the Senate occupied its new chamber by January 1859. Walter's fireproof cast iron dome was authorized by Congress on March 3, 1855, and was nearly completed by December 2, 1863, when the Statue of Freedom was placed on top. He also reconstructed the interior of the west center building for the Library of Congress after the fire of 1851. Walter continued as Capitol architect until 1865, when he resigned his position over a minor contract dispute. After 14 years in Washington, he retired to his native Philadelphia. 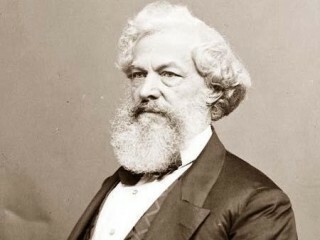 Then, when financial setbacks forced him to come out of retirement in the 1870s, he worked as second-in-command when his friend and younger colleague John McArthur, Jr. won the competition for Philadelphia City Hall. He continued on that vast project until his death in 1887.